"Miss Sloane" is a long, emotionally brutal film that I had to steel myself to stay with. 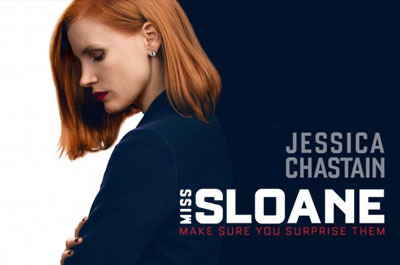 It was the remarkable performance of Jessica Chastain that held me, made me want to know the full unravelling of this woman, Elizabeth Sloane. At the end though, I felt hollow. I was still reaching for a missing piece - what is the backstory of this character, I kept wondering? That Sloane was driven by a singular will to win, that she ruthlessly arranged the details of her life to keep her top of her game, I saw. Yet still I felt cheated of a crucial element of a back story that could credibly explain the psychology of this character. Did I miss something? Richard Brody I agree that, contrary to some critics, backstory is usually a great improvement to a movie--the use of it is one of the advances in recent films--and the lack of it is an all-too-rare failing. Of course, there are exceptions; symbols and ideas can do the same thing; but that's a matter of higher artistry, not just thoughtful planning. Olivier Tytgat True, though it's probably one of the hardest things to pull off without making it seem tacked on or forced, in which case I'd rather have a character of which you can only guess at their backstory instead of it being fed to me through clunky exposition. Patrick McEvoy-Halston Sloane was the smartest person in the room; an inspiration to everyone young and liberal; does whatever has to be done, not only without flinching, but with expansive imagination; fiercely uses even friends if they're best use is as props of her own rather than themselves, independent agents (not quite ruthless or smart enough... hindered, hampered... limited); is kind and empathic towards members of the servicing class, even as she enjoys the privilege of her dominion over them. She is... Hillary Clinton? Debbie Wasserman Schultz? What everyone, previously, wanted to be?... Do we need backstory? She is emblematic of what it is to be alive to the world, circa 2016, but not, RIP. Her point isn't to have a past... it is to be the garb we all just previously wanted to slip into.